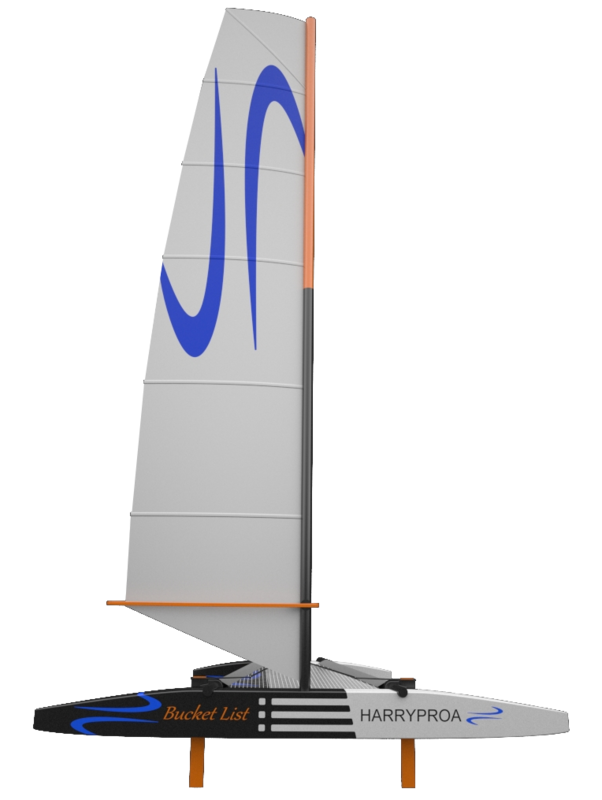 To enable people to compete in multihull offshore races at reasonable cost, with a very high chance of finishing and a good chance of winning the 40’/12m division. To achieve this, the boat has to be low cost, fast, safe and simple. The only boat that fits these criteria is a Harryproa. 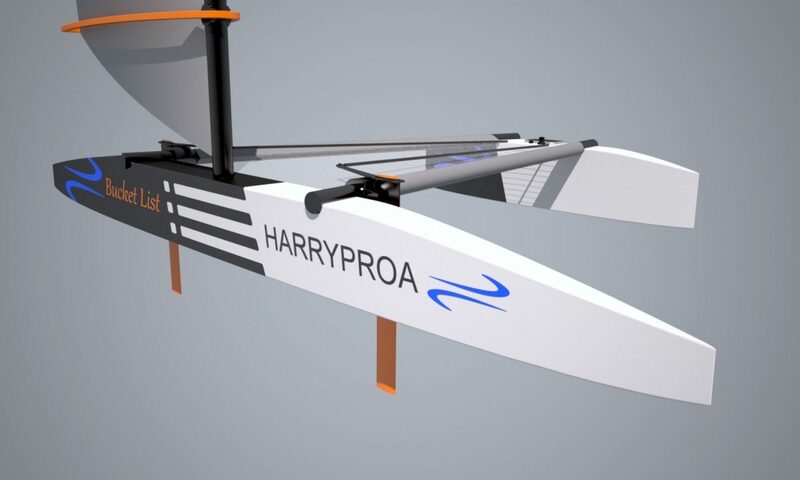 Harryproas are sailed the same as other boats, except instead of tacking or gybing, you shunt. Ease the lightly loaded sheet, pull in the new one and sail off in the opposite direction. A little slower than tacking or gybing, but much safer, especially in a blow. Bucket List is 12m long, 7.5m wide, weighs 700 kgs and has 57 sqm of sail on an 18m mast (40′ long, 25′ wide, weighs 1,540 lbs and has 600 sq’ of sail on a 60′ mast). This is far lighter than any other 12m multi. 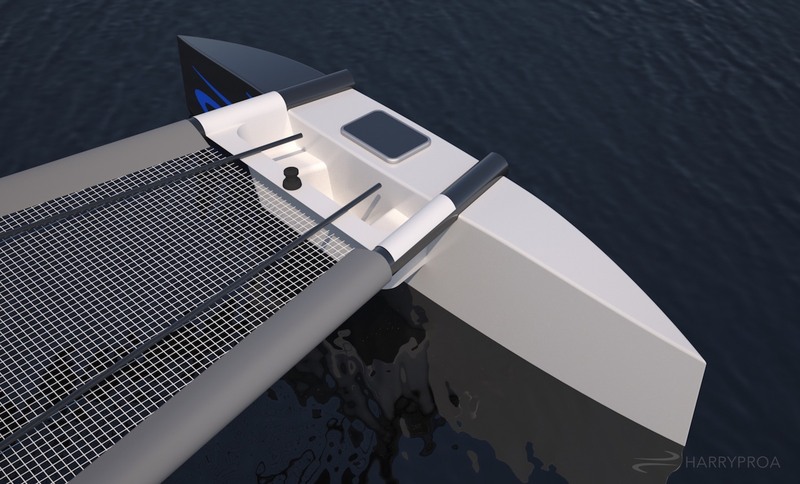 The hull shapes are optimised for speed, rather than easy tacking (not required on a shunting boat) and with their flat bottoms, they will plane in the right conditions. Light air speed is about mast height (there is more wind up high), sail area and wetted surface. 18m, 57 sq m and 9.5 sq m/100 sq’ are a combination which will be very quick. In medium air it is about power to weight (Bruce #) and minimising drag. A loaded Bruce # (imperial) of 2.1 is high. Frontal area is 2.7 sqm is very low. Strong air is about righting moment. Bucket List will theoretically fly a hull in about 12 knots of breeze (less if the crew sit to leeward), but because of the flexible rig, the actual hull flying wind speed is closer to 20 knots, which is fast cruiser territory. Two rudders are less drag than 2 rudders, 2 boards and their cases. Less again as the rudders can be lifted for flat water or off the wind sailing, balance, shallow water or riding out a storm. They also allow the boat to be crabbed upwind to squeeze round a mark or climb out from under a windward boat. Bucket List has a fuse on the main sheet cleat which releases at 30 degrees of pitch or heel. If it does capsize, the buoyant mast stops it going past 90° from where the buoyant boom will right it without the crew getting wet. The rudders kick up in a collision or grounding and are easily lifted, resulting in a 100mm draft with nothing to trip over on a breaking wave, and the ability to surf up the beach and step ashore as a last resort. Large, easily replaced foam/glass buffers on the hull ends minimise collision damage. The single sail rig means you never have to venture outside the beams. There is no dangerous foredeck work, and none of the dramas associated with extras. The wishbone boom is above head height if you are on the tramp. The hulls are foam cored and compartmentalised. Even if it was severely holed, Bucket List would still float and could still sail. 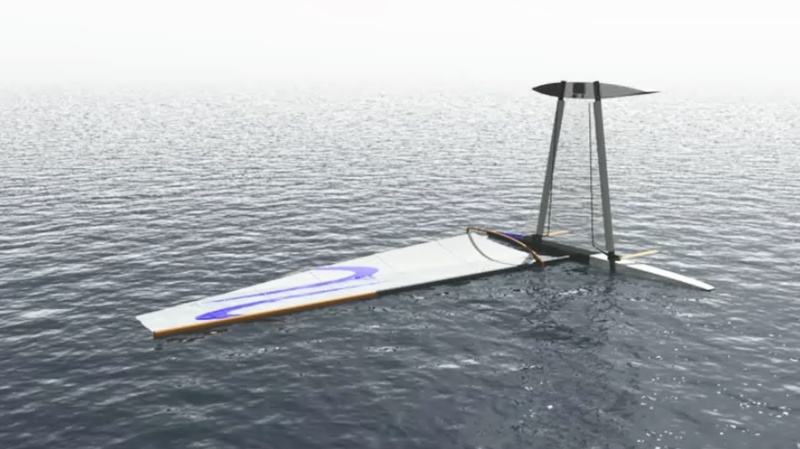 The flexible mast automatically dumps power in an unexpected gust. The absence of stays means the sail can be reefed, raised, lowered or totally eased on any point of sail and any wind strength. Harryproas have 1.5 hulls rather than 2 or 3 so they are the lightest, hence cheapest multihulls. 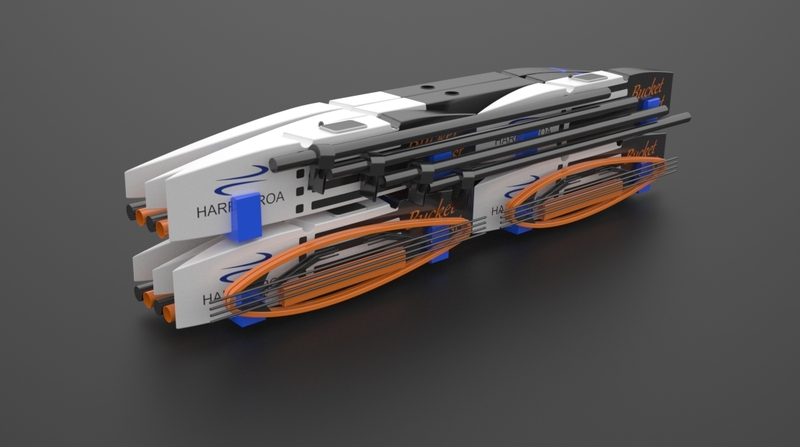 Smart design has reversed the design spiral to make everything lighter and cheaper, leading to further weight savings, smaller rig, lower loads and so on. Bucket List is built from the highest quality resins, fabrics and cores, all vacuum infused using low labour techniques, an example of which is that there is no fibreglass grinding, no sanding and no post infusion laminating required. The finish is workboat rather than showroom. Not only much cheaper to buy and apply, but quick and easy to repair. Low cost also requires simplicity. An unstayed mainsail only rig, with 4 lines to control it via one single speed winch. The only other deck gear is the compass. The halyard has a simple, reefable lock, and a single reef line is used for all the leech reef points, without having to lower the sail to rethread it. Accommodation is spartan, but adequate for people who want to race fast. See OPTIONS if this is not you. Bucket List uses oversize, beam mounted rudders instead of daggerboards. This has been a harryproa feature for 15 years, works well and is much lighter, safer and cheaper. Bucket List is engineered, designed and built not to break. This is easily said, but actions speak louder than words. We will replace anything on the boat that breaks, apart from collision damage. 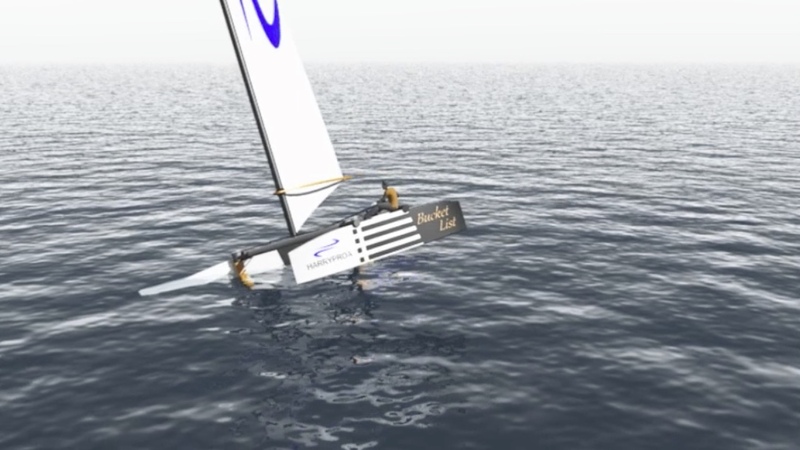 This should make it one of the few racing multihulls that is insurable. The cost savings are not just from the build and low insurance. They extend to near zero maintenance. The living area is small and completely open and the rest of the boat is sealed compartments. The rig has no fallible components and apart from the sail, nothing to wear out. Feedback (and belated common sense) indicated that Bucket List would be uncomfortable to sail for long periods. So we added a cockpit. It increases the weight by about 15 kgs, but it is in the right place, to windward. The great thing is, that it can be removed and stored in the little hull, so we still get 4 boats in the container. 4 boats can be stored in a shipping container rather than leave them exposed to the weather and potential theft in a marina, with regular scrub offs and annual haul out for antifouling. The container only works if the boats are extremely easy to assemble and launch. This can be done by 2 people in 1 hour, with no tools, cranes or machinery required once the container is off the truck. The boats can be launched from a ramp or a beach on their custom trolleys. A container of 4 boats can be shipped to and from any major port for ~$1,500 per boat or easily trucked to inland venues like the Swiss Lakes for the Bol d’Or or Chicago for the Chi-Mac. Bucket List costs $US50,000/40.000Euros, ready to sail. This includes the 2 hulls, trampoline, sail, jackline, all rigging, compass, winch and carbon beams, mast, rudders and boom. All painted and antifouled. It also includes anchor, chain, warp, fenders, mooring lines, nav lights, batteries, solar panel, tracker, vhf and outboard motor. To reduce corrosion issues, these items are all easily removed from the boat when it is not in use. It is expected that most users will have all or some of their own wet weather, navigation and safety gear. We encourage them to use it. For those that don’t, it can be hired as a seperate package. In order to debug the boat and the usage system, the first one will be based on the Gold Coast, Australia from where it will be available for all the east cost Australia races (see Australian races at the bottom of the page). Once proven and finance permitting, a fleet of 4 will be established in St Malo, France where they will be available for European races. In the winter, they will be shipped to the Caribbean for the season there. To minimise the paperwork and place the responsibility for the boat on the user, the boats will be sold for $US50,000, with an agreement to buy them back at a set price in a set time, less any collision damage. The buy back price is calculated at $500 per day of ownership. So, if you want a boat for the 7 days of Hamilton Island Race Week, the buy back price will be $50,000-(7 x 500=3,500) = $46,500. What you do with the boat during your ownersip, is entirely up to you. This arrangement and the costs are not set in stone, but do seem to be the simplest way of getting people racing. For those who want a skipper or crew, Rob is available. $100 per day plus travel costs. Negotiable downwards for interesting or exciting races, which is pretty much all of them at this stage. Freight Gold Coast to/from Aus east coast incl Melbourne: $2,000 each way. The East Australian Race calendar includes the following races:Dates are for 2015, 2016 should be similar. There are also numerous passage races and round the cans races in Brisbane, Sydney, Melbourne and the Gold Coast. Not all these races are open to multihulls. The races that are, will accept or refuse proas on a case by case basis. If you want to race officially, check with the relevant race committee first. If they refuse your entry, you can save the entry fee, forego the silverware and race unofficially. Or stay home and wish you had. We are eager to build the fleets so time share ownership is encouraged. For the first 50 days use, there will be no fees. After that, we take 10%. There are no limits on owner days. Anyone wishing to buy a share in a boat for an equivalent share of it’s net income is welcome to apply. As is anyone interested in setting up a boat or a fleet elsewhere in the world. Full naming and signage rights of a single boat are available for $100 per day that the boat is used. Naming rights for the type (ie Volvo 65) are negotiable. The early publicity for the boat should be significant, so the sooner this option is realised, the better the return. Strong wind races or deliveries: The top mast can be removed and the reefed sail used. The reduced weight and windage aloft will increase the speed and reduce the potential for drama. Light wind races: The top 6m section of the mast can be replaced with a 12m section and a 76 sqm mainsail, giving a Bruce number (imperial) of 2.5. Bucket List can also be supplied with shorter beams and a larger windward hull, containing 2 double bunks, headroom, galley and a cockpit for 4. This would be suitable for longer races or cruising. Guess the answer and win the prototype for a day!